I am on the train back to Kingston, having just completed a fairly intense four day movie marathon at the Toronto International Film Festival (TIFF). In the past few months I have also been lucky to participate in a minor way in the making of four feature films being made by creative and talented friends and fellows. This year at TIFF I had a different view of the films I saw, knowing what huge effort goes into making them. In addition to the screenings of hundreds of films, world premieres and black limos hauling celebrities around the downtown core, thin blonde women in slinky dresses and uncomfortable-looking shoes, there were also great question and answer sessions after many of the screenings. Sarah somebody? Must be a celeb. Everyone wanted a picture but your guess is as good as mine. People lined up on the street for hours to grab a view of the stars. 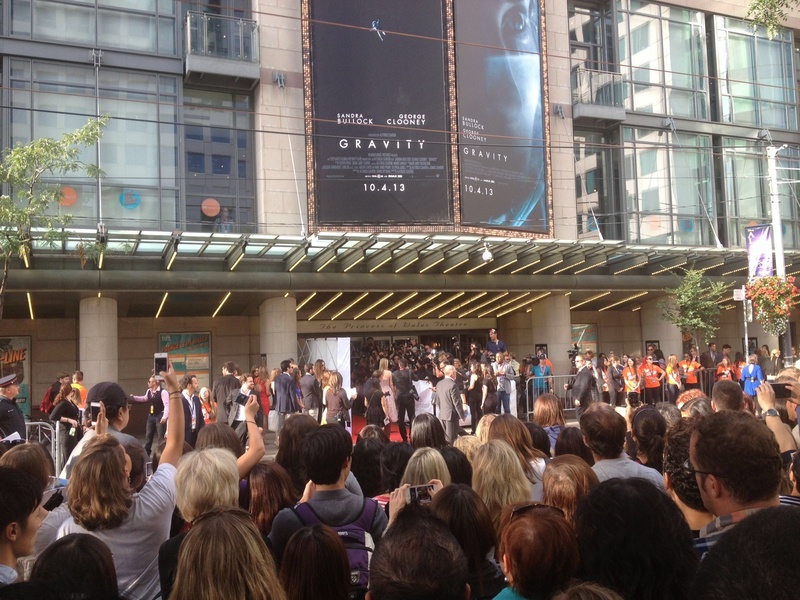 On Friday I passed a group behind a barricade outside the Princess of Wales Theatre all hoping to see Brad Pitt. I hung around for a few minutes but had no idea when or if he was to appear. I had another film to see down the street so I left. When I came out of that film the crowd had swelled considerably. Black cars were letting people out in front of the theatre and flashbulbs were popping. I asked the woman in front of me who we were looking at on the red carpet. She didn’t know. “She is blonde and I think her name is Sarah something,” she said. I took a picture. I have no idea yet who she is. I tried to get through the throng to meet a friend for dinner. It was impassible so I backtracked and rounded the corner. When I was about one minute away the crowd erupted into screams. Brad Pitt had appeared. I missed him but really didn’t care. You see two actors in the film. Behind them is a horde of other talents creating the finished product. The actors in a film certainly are integral to its success and often give incredible performances. But they do get their share of deserved public recognition. The more hidden stars of a festival like this are all the others whose work goes into making a great movie – the screenwriters, directors, DP’s (Director of Photography) and, yes, Mike Gourgon, the sound people. I have, in my brush with movie-making, come to realize that the effusive accolades are sometimes misdirected. This year at TIFF I made sure that I appreciated much more all those behind-the-scenes people who bring us such magic in film. It takes a team. 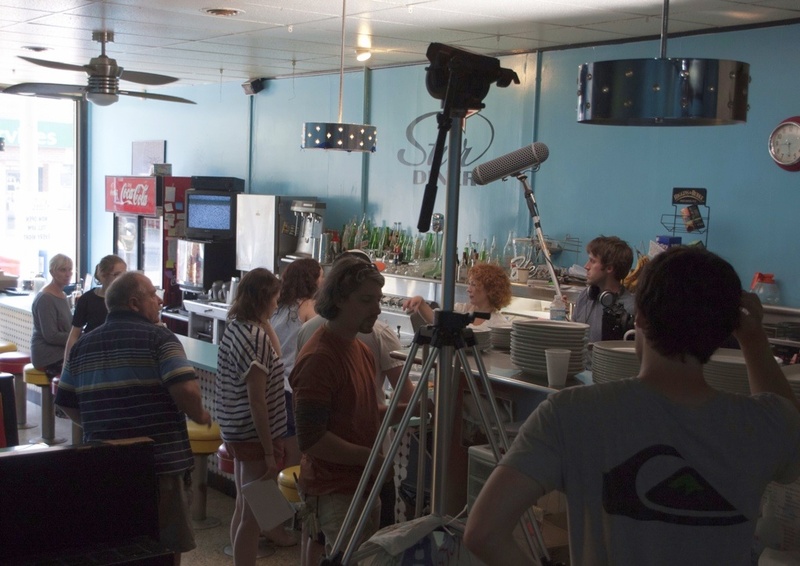 Christian Paulo Malo (DP) and Alex Daniels prepare a close up take for the movie FAULT, directed by Leigh Ann Bellamy. This entry was posted in Uncategorized and tagged Actors, Celebrities, credit, Director, Fans, film, Movies, TIFF, Toronto by johnageddes. Bookmark the permalink. Cool beans, DJJohnnyG. Being married to a film nerd has definitely changed how I watch movies.